Flowering deciduous trees with pink, white or red flowers and fruit which is edible or showy, sometimes both. Most grow 6' to 30'. Leaves are pointed oval, deep green to nearly purple. ​​Almey - upright, up to 15'. Young leaves purplish, mature leaves bronze. Single, scarlet blooms, white at base. Scarlet fruit. rose bloom. Fruit is green (image)​. Dolgo - one of the hardier crabs. Tree grows upright and has willowy branch spread. Grows in height from 30'-35' with equal spread. Leaves are glossy green and dense. The flowers are single and white. The fruit is large, red and is edible. Eleyi - a graceful tree. Leaves are veined. Flowers bloom in April and are deep red. Floribunda - dense, horizontal branching. Grows in height from 15'-20' with a spread of 25'. Leaves are small and green. Flower is a single, red bud opening to pink and then fading to white. Harvest Gold - vigorous, upright growers. Height reaching 15'-20'. Foliage is medium green. 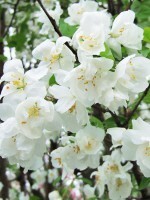 Flowers are large single white blooms. Fruit is the key to this crab because they are rich gold remaining until late fall. It is very disease resistant (image)​. Hopa - tree is upright, broadening some with age. Grows in height up to 20' with a spread of 25'. Leaves are dense with a dark green color. Flowers are single, pink with a white center, fragrant. Fruit is orange, good for jelly. ​Klehm's Bechtel - round head form with soft, green foliage which turns orange in fall. Grows in height from 20'-30' with a 20' spread. Flower is a fragrant, very large, double pink bloom. Blooms late in season. Madonna (Plant Patent No. 6672) - tree is compact and upright. Grows in heights from 15'-18'. Leaves are dark green and disease resistant. Flower is large, double white blossoms that bloom early and last longer than other crabs (image)​​. 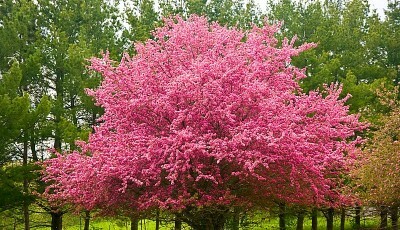 Pink Perfection - tree form has a rounded head. Grows in height up to 20' feet. Leaves are thick and dark green. 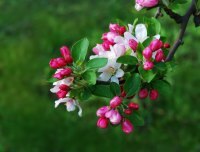 Flowers start with red buds opening into a double pink blossom. Almost non-fruiting. Profusion - Upright, spreading growth. Grows in height from 15' to 20' with an equal spread. Leaves are purplish when young, changing to bronze-red. Blooms with a single, deep pink flower. It has small, maroon fruit. Red SIlver - Fast growing with dense branches that tend to droop gracefully. Grows in height from 20' to 30' with spread of 15'. Leaves are reddish-bronze, silvered with silky hair. Flowers are single, deep wine opening to pink. Fruit is purplish-red and good for jellies. Robinson - Vigorous grower with upright habit early, later spreading with dense branching. Height 20' to 25'. Spring foliage is purplish-green turning deep green in summer and turns orange in fall. Flowers are deep pink. Fruit dark red hanging late into fall. Disease resistant. Royalty - Dense, mound-like crown. Grows in height to 15' with equal spread. Leaf is dark purple, one of the prettiest foliage colors. Flower is a single, purple bloom. Fruit is dark red (image)​. Sargenti - Dense with branches looking much like a shrub. Grows in height from 6' to 10' with a spread of 8' to 14'. Leaf is dark green. Flower is a profuse blooming of single white blooms. Flower is fragrant. Fruit is small and red in color. Selkirk - Upright and spreading. Tree matures to 20' in height. Foliage is reddish changing to bronze-green in summer. Flowers are deep pink. Snowdrift - A strong, uniform tree with broad rounded form. Grows in height to 20' with equal spread. Leaf is a glossy green. Flower is a single that has a pink bud, blooming white and fragrant. Fruit is bright red ​(image)​. it a very clean crab. Sugar Tyme (Plant Patent No. 7062) - Tree grows in an upright oval form. Foliage is shiny green and it is disease resistant. Buds are pale pink and blossoms are snowy white and completely covers the tree. 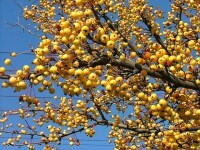 Masses of rich red fruit are effective from mid October, remaining colorful into January. Zumi - Tree has a rounded form. Grows in height from 12' to 15'. Leaf is dark green. Flower is single, white and fragrant. Fruit is bright red. Candied Apple (Plant Patent No. 4038) - The tree branched horizontally to pendulous with an irregular pattern. Leaves are heavy textured dark green with an overcast of red. The flowers are pink. Fruit is bright showy red. Disease resistant. Echtermeyer - Grows in height from 12' to 15'. Leaf is purplish, turning to bronzy-green. Flower is purplish-red, fading to a pale pink. Fruit is purplish-red. Red Jade - Long, slender, weeping branches show off the profuse, single white blooms. Grows in height from 12' to 15'. Foliage is green. 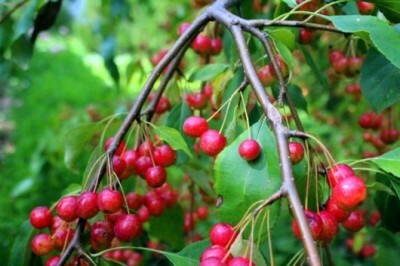 Fall fruit is cherry-red ​(image).